he predecessor to the SM58®, The 565SD Classic Unisphere® Vocal Microphone is a dual-impedance, unidirectional dynamic microphone famous for its spot on the Woodstock stage. It features highly effective wind and "pop" filter for vocals and a durable, wire-mesh front grille. 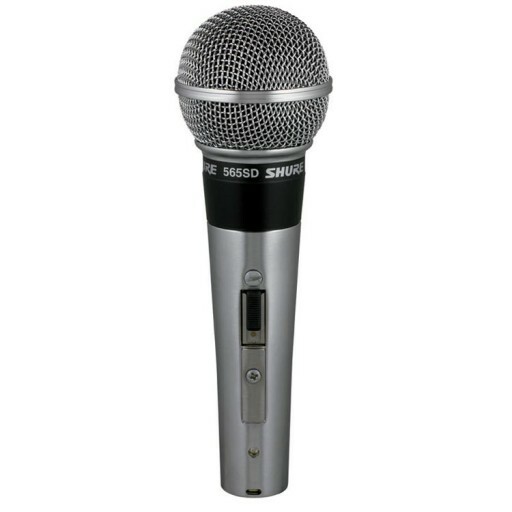 Shipped connected for low-impedance operation, the 565SD provides excellent vocal or speech reproduction onstage, and can also be used with public address systems. lmpedance : Dual. Microphone rating impedance is 150 ohms (250 ohms actual) for connection to microphone inputs rated at 19 to 300 ohms and "High" for connection to high-impedance microphone inputs. Wired for low impedance as supplied. Polarity : Positive pressure on diaphragm produces positive voltage on pin 2 (with respect to pin 3). Switch : Built-in magnetic reed on/off switch with lockplate. Cable : 565SD-CN: 6.1 m (20 ft) two-conductor shielded, rubber-jacketed, detachable, with XLR connectors.